Don’t look for closed doors in the East Jackson office building that the 21-person firm designed for itself and has occupied since 2000 — Carney Logan Burke is one of the area’s most prolific and diverse firms. 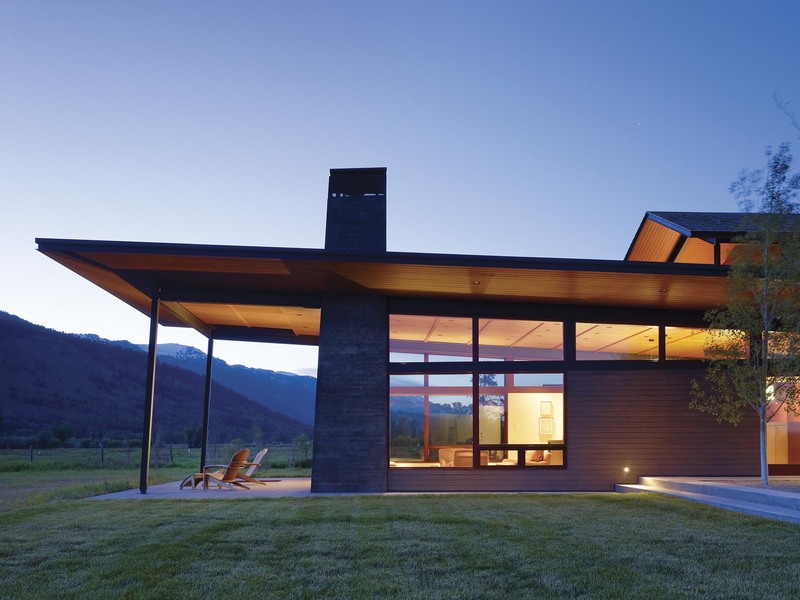 It was named the AIA Wyoming Firm of the Year in 2004 and the 2009 AIA Western Mountain Region Firm of the Year. The new 45-story Four Seasons Hotel & Residences in Denver? Carney Logan Burke was the Design Architects. The firm also did, in 2008, the lower tram terminal enclosure for Jackson Hole Mountain Resort’s new tram. 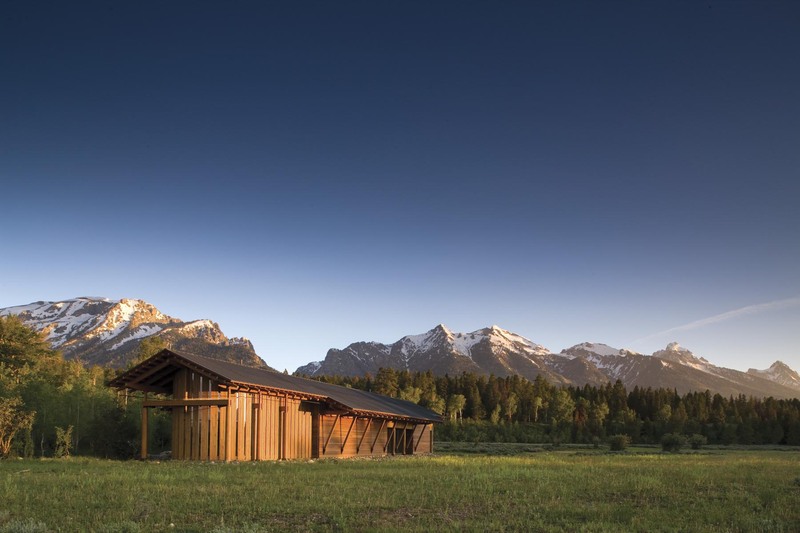 Its most-written-about building may be the Laurance S. Rockefeller Preserve Interpretative Center in Grand Teton National Park. Opened in 2007, it was the first LEED platinum building in Wyoming and the National Park Service. 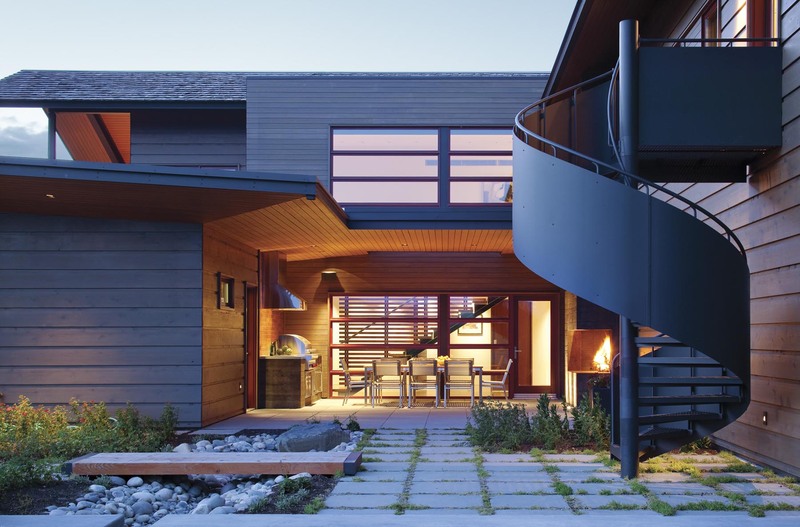 And of course Carney Logan Burke does residential projects — they’ve done over 100 of them so far. 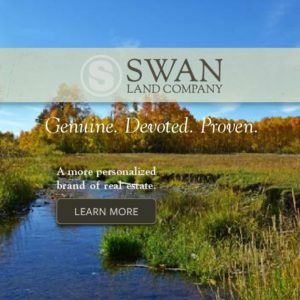 They’ve added a 300-square foot wine silo to an existing building located in the Snake River floodplain (which made a traditional wine cellar impossible). 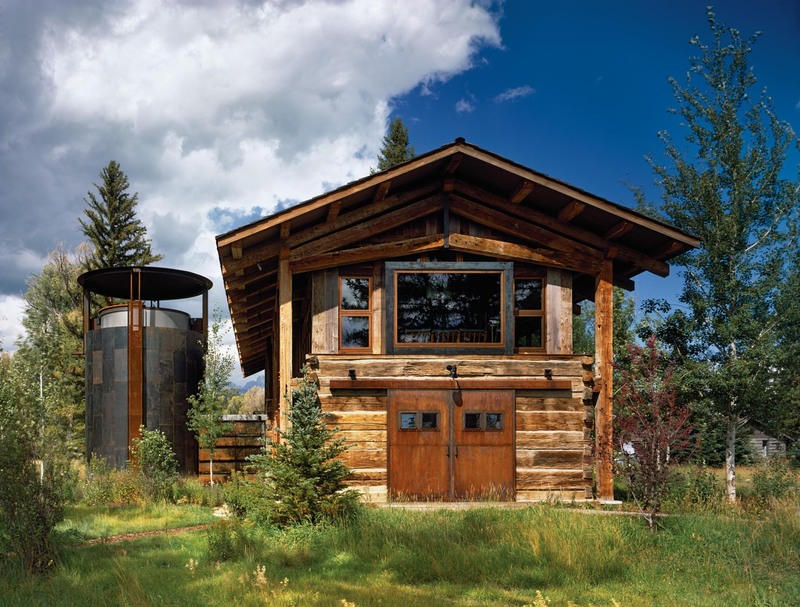 It received awards from the AIA Western Mountain Region, Custom Home and Residential Architect and was featured in Big Sky Journal’s 2008 Arts Issue. “We have a love of traditional forms, but a much more Modernist aesthetic,” Carney says. “We work within vernacular forms, but challenge ourselves to interpret them in a fresh way.” The LSR Preserve interpretative center is a perfect example of this. Walking into it, it evokes some traditional national park forms, but you’d never mistake it for a building from the 1920s or 1930s. Carney was drawn to Wyoming because he had spent his childhood summers at a family ranch on the Upper Green River near Cora, Wyo. “I realized that if we were going to do this in Wyoming, it would have to be in Jackson,” Carney says. The firm was founded in a rental house in Teton Village. Carney would work at the dining room table. The printer was in the garage. After a few more years, Kevin Burke, AIA, joined the firm’s ranks. Like Carney, Burke spent his childhood summers in the West. Where Carney was in Cora, Burke was dividing time between grandparents in northern and southern Idaho. While Carney Logan Burke designs projects across the West — and around the world; they’ve worked as far a field as Hertfordshire, England — it is important to the partners to be part of the Jackson community. “We moved to this place to try to make it better through our craft,” Carney says. Few doubt they have, from the countless residences they’ve done to the LEED certified Jackson Hole Airport expansion in collaboration with Gensler Architects, the new Home Ranch Welcome Center presently under construction, the Center for the Arts in downtown Jackson, and the new Jackson Hole High School. 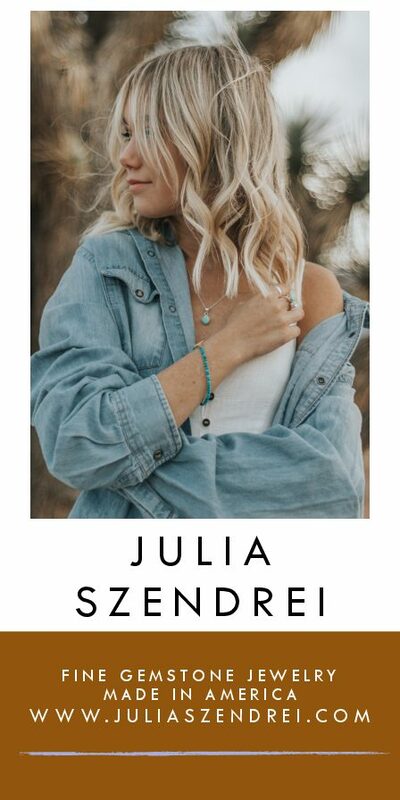 “When we first started thinking about the high school, all I could think was that we’re going to affect more kids through that than through all of our other projects combined,” Carney says. “I think our work has tried to fit into the community while also pushing the envelope a bit,” Carney said. Directly across from Carney Logan Burke’s modern-yet-full-of-western-character office building is the Bear Creek Office and Residence. While the CLB office used materials such as stained concrete and exposed steel structural elements, the Bear Creek building is stone with cedar siding; re-sawn timbers support the generously overhanging roof. Inside there are log columns, iron railings, and more massive timbers. “There are people who look at the two buildings and think, “We’d hire the guys who did one of them, but not the guys who did the other,” Logan says. Surprise: Carney Logan Burke did both buildings. “We think that’s a strength; we’re able to respond and listen to our clients,” Logan says. with its expansive shed roof, tilts up to recognize views and capture daylight for the primary living spaces. Broad overhangs, articulated in wood, taper to a thin steel “brim” that protects the buildings from harsh western weather. 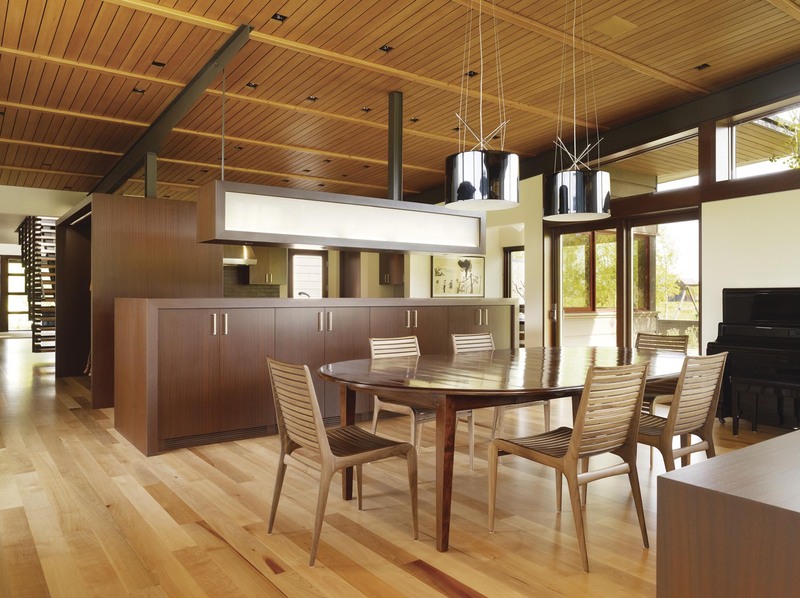 In the Peaks View dining room and kitchen Sapele cabinetry separates the spaces. 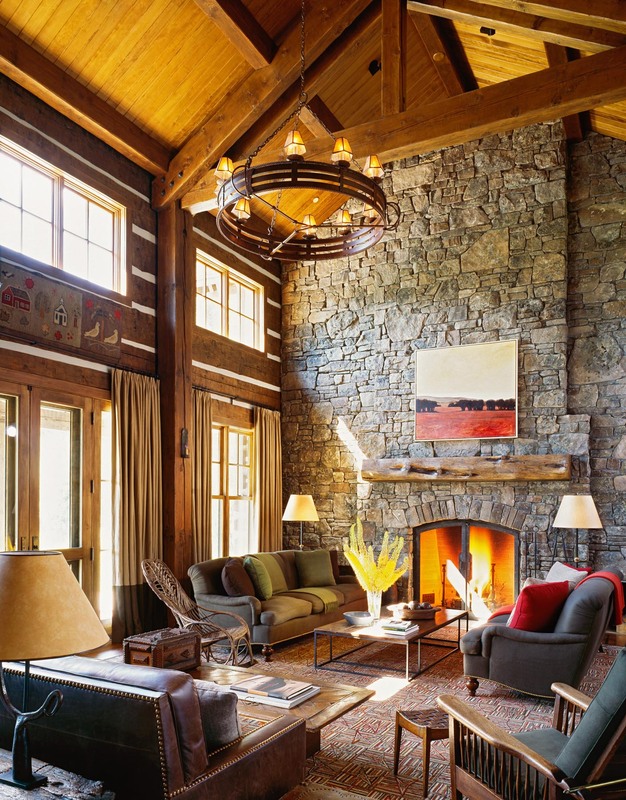 FSC Certified Madrone floors, hemlock ceilings and steel detailing add warmth and texture in the primary living space.